A strainer is an essential tool for any bar and this Yukiwa triangle Strainer is one of the best. Made out of brushed stainless steel, this stylish strainer is weighted and effectively strains any stirred or shaken cocktail. Fits well on Yukiwa Mixing Glasses and most standard bar glasses. This traditional Hawthorne-style strainer is distinctive with its long handle and heavy weight. Shake or stir your cocktail, and the tight coil helps to better strain out ice and any other ingredients as you pour the drink into a glass. 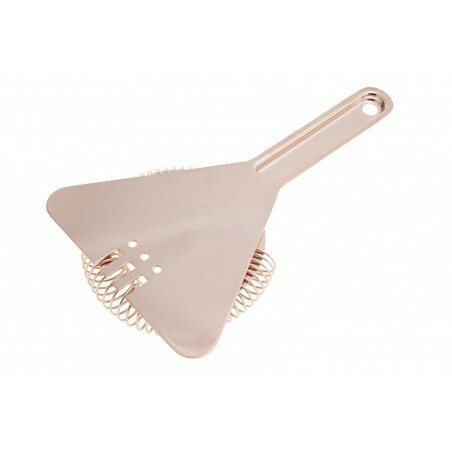 The holes on the back of the strainer form a T-shape - a stylish, modern touch.